Ethnobotany has long since been a source of interest for worldwide studies, the relationship between the people and plants and their corresponding effects. This Guide is dedicated to providing unbiased and detailed reviews of popular ethnobotanicals, primarily but not limited to Kratom and Kava. Our intention is to cultivate a streamlined, concise, centralized and easily navigable website; substance over style. Kratom has made quite a splash since its introduction to gift, variety stores, and online shops in the before the turn of the 2010's, yet there is still yet to be a site that both consumers and vendors can come to trust when it comes to quality product. This is where Secret Garden Guide comes in. We will be providing unbiased and detailed reviews of other common ethnobotanicals, primarily Kratom and Kava. For those who have not yet tried Kratom (Mitragyna speciosa) or are unaware of its existence and place in both popular and traditional culture, there are a variety of articles online covering the merits and controversy of this unique wonder of botany. Kratom is known to provide fantastic aromatherapy. NOTE: Kratom is NOT for human consumption. It is reviewed here as an incense. Kava (Piper methysticum) has been present in popular culture for a much longer period of time. Kava bar establishments can be found scattered throughout various countries, and are sold in most drug stores as common as your local Walmart or Walgreens. Much like Kratom however, quality drastically differs from source and preparation. Often times store shelf Kava is not near as potent as manufacturers that specialize in extracting kavalactones from the root. Our rating system is nothing revolutionary or algorithmic. It is typically simply a numerical value out of 10 which the reviewer makes a decision based on what they feel best represents the quality in various categories, such as potency, qualitative categories when appropriate, value and an overall score (not an average). These values are coupled with an in-depth and detailed review. Something we consider unique to our system is, where deemed appropriate in a manner which will give the reader an even more in depth idea of what to expect out of the product, we will include a graph depicting the timeline and quantitative measurements of specified qualities (i.e. potency). VALUE: Value is based on the weight/amount of capsules emptied into your incense bown along with the price and the potency. OVERALL: This value is based on the reviewers overall assessment of the product's quality, taking everything possible into consideration. Again, this is not an average or calculated score based on other variables, but simply reflects the overall quality of the product top down. To notate the passage of time we use (t+hrs:min), meaning "initial burning"+hours:minute passed by. I.e. (t+0:30) means 30 minutes after ingestion. To notate potency as time passes we often use (p=x) meaning the approximate potency at the time is "x" i.e. (p=6) mentioned in the context of (t+0:45) means that 45 minutes following the lighting of the incense bowl, the potency of the product can be estimated at around a 6/10. PROPERTY METERS show the product's "kratomatic" effects succinctly in a meter ranging from stimulating to sedating. Red veined strains are typically produce a more sedating scent, green veined provide a more balanced experience, and white is known for its stimulating aroma. However, it is not that cut and dry. The type of strain effects this factor too, as well as the Kratom's origin, age, processing methods and other factors. This meter does not demonstrate the overall quality of the product, but simply describes the sensation to expect from the product's aroma on a scale of sedating to stimulating. This will help the reader determine which product may be most suitable based on their taste. 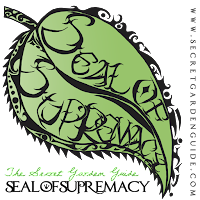 At The Secret Garden Guide we want to help Kratom and ethnobotanical fans find the product that is just right for their tastes, and we feel this is a great way to further cater to that purpose. Some of you may be curious as to why many of our ratings are high (often 8.0+). It is essential for our audience to understand absolutely no promotions or paid advertising (paid anything) will ever have influence on our reviews and articles. "Integrity" is, after all, a main factor in our slogan and what has garnered us a faithful audience after our year of existence. Assessments are a genuine personal reflection of the product's worth, rest assured. Vendors have been bold enough to seek us out knowing their products will reviewed in front of a growing audience. Also it should be noticed that these strains are reviewed at separated times, and so it is impossible to remember exactly how they compare. Therefore, say we have an 8.6 for Product A and 8.8 for Product B in our Reviews & Awards section. These are very close scores, and it is entirely possible that another individual, or even the same could try them back to back and feel the opposite. Nevertheless, when it comes to our medals (Bronze, Silver and Gold) we make sure to take that seriously. A gold pretty much implies a "must try." Please e-mail us with any inquiries to receive a package filled with all the information you need on advertising at The SGG. In order to more efficiently churn out reviews, we take on Certified Assistant Reviewers (CARs). If you are interested in becoming a CAR, please e-mail secretgardenguide@gmail.com with a brief blurb about yourself and a sample review for consideration. *Vendors, be sure to verify the identity of these individuals. If in doubt, e-mail me. 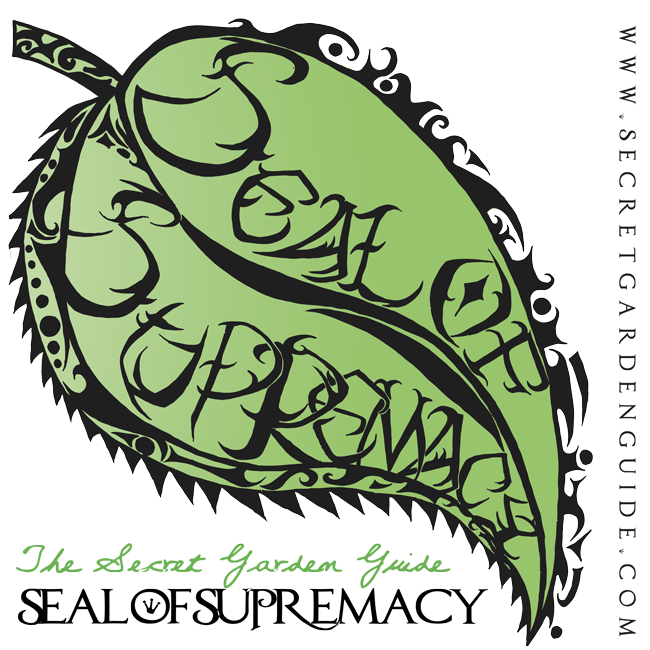 Special thanks to Shannon for developing the illustrious "Seal of Supremacy" logo. Anyone looking for a superbly talented artist should check out her work @ www.shannon.gallery and give her a shout out. I would highly recommend you reviewing Blue River Wellness (Coastal Kratom), Velvet Soul Naturals, and Mood & Mind. All three are my absolute top 3, in terms of product quality and consistency. Thank you for the recommendations Kristen. Kratom is in a bit of a conundrum now but we will be sure to look out for those names when things clean up if they're still around.